The dangers that threaten our natural environment is a recurrent theme in these blogs. Not so much because it is a pleasant subject to write about, but simply because it is something that has to be repeated over and over again. Until society and its political and economical leaders realize that its destroyal could also imply the end of the human species. The natural environment concerns miriads of species still living in the wild forests and oceans. Which people who care about nature and the under water world will not accept to be destroyed. But what can be done? The Coral Triangle: an area suffering most from blast and cyanide fishing. Expansion of responsible diving tourism and the establishment of Marine Protected Areas can help in creating an economical counterforce that concurrently will protect and conserve a wealth of marine life, including the splendid coral reefs. And it would also offer new employments for the local populations. But this can only succeed if local and national authorities accept to play a leading role in establishing and guarding these areas. Climate change Many people feel troubled by the change of our climate, and its effects on the environment. The cause is believed to be massive fossile burning, leading to global warming of the earth. The Paris Agreement could be an important step to mitigate global warming. But its alarming manifestations, such as melting glaciers, permafrost and ocean ice are not something that can be restored in a couple of years or decades. Global warming probably started already with the onset of the industrial revolution, some 200 years ago. One reason why its effects are now so alarming, could be that global warming is not a linear (1,2,3,..,) but exponential (1,2,4,8,..) proces. Then there are the climate ‘sceptics’. They may accept climate change but deny that the cause is environmental. They might even consider the environmentalists as agitators from the left that are out to destroy capitalism. In an ironical way, I hope that the sceptics are right, because when climate change is natural not environmental, there is nothing more we can do than lean back in our chair and accept the caprices of mother nature. Direct human interventions Climate change however should not be our only concern. The current damage of the natural environment is for the largest part caused by direct human interventions. The list seems to be without end. Oil platforms, massive oil spills, cutting down rain and mangrove forests, the ivory trade, finning of sharks, and last but not least massive pollution of the air as well as the oceans*. Tons of plastics drifting in the sea have now even reached the most remote pristine areas in the world. Even the climate sceptics may go along with this, although they will argue that industrial pollution is simply the price modern world has to pay for greater prosperity and a healthy economy. Helping to protect parts of the environment that we cherish and want to preserve for future generations is something we can do on the short term. Its damage often results from blind search for profit. Or from bad management and illegal activities, such as the trade in wildlife were criminal organizations cooperate with authorities and corrupt members of the policy forces.The same holds for destruction of the marine environment, of which some examples are given below. Destructive fisheries Destructive, often illegal fishing practices are currently the most acute danger for the marine environment. Many fishing boats still carry on with these practices, despite the fact that national legislations have identified and banned many of them. This list also seems to be without end. One is overfishing which means that more fish are caught than the population can replace through natural reproduction. Its is driven by what is called Tragedy of the commons: each of many fishers is self-interested and benefits financially from a large common pool of fishes. The fishers assume that the resource pool is so large that each of their large-quantity harvest is seen to be of little harm to the resource pool. Hence they behave in ways that advance their own interest by fishing as much and fast as they could each time they fish. But catching too many fish harms the balance between marine species and will reduce fish stocks to below acceptable levels for populations that depend mainly on fish for their proteins. Bycatch often occurs when ship use driftnets or gillnets that catches non-target species like sharks, turtles or dolphins. Another is bottom trawling, a nasty industrial method used by big boats in the high seas. Enormous nets weighed down with heavy ballast are dragged along the sea floor, raking up or crushing everything in their way, from fish to ancient coral. Then there is ghost fishing, which are nets made of long lasting synthetic material that are accidentally or intentionally left in the sea. These nets continue to trap fish and even large marine mammals, which die of exhaustion or suffocation and struggling to get to the surface to breathe. Most of these methods result from poor fishery management leading eventually to financial losses through depleted stocks. Blast fishing occurs primarily in Southeast Asia, the western Pacific, and eastern Africa. 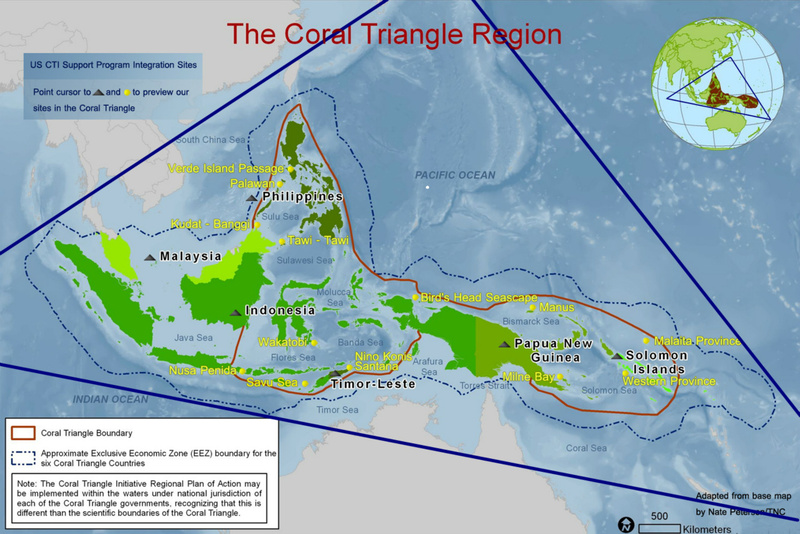 The Coral Triangle (see insert) is the area that suffers most from this aggressive fishing method. For example, a study conducted in 2002 reported that fishing with explosives had caused the degradation of about 70% of Philippine coral reefs and reduced annual fisheries production by about 177,500 metric tons in the 1990s. This biological wonderland – which spans Indonesia, Malaysia, Papua New Guinea, the Philippines, Solomon Islands and Timor-Leste – not only contain numerous splendid coral reefs, but also thousands of islands rich in mountain forests and woodlands. Blast fishing is often used by local fishermen in smaller boats that find the techniques to be easier and more productive than traditional methods. Home made bombs consisting of a mix of kerosine and fertilizers are most popular. After the bomb explodes, the fish killed or stunned by the shock wave from the explosion are collected. Underwater shock waves produced by the explosion stun the fish and cause a desolate gray moonscape. Even coral gardens that were among Asia's most spectacular dive sites like Mabul and Komodo National Parkhave have been the victim of bomb blasting. Poison or cyanide fishing is another method often used in the South East Asia triangle. In many places the use of poison to catch fish is a traditional technique, but negative effects have multiplied since plant-based substances were replaced by chemical poisons. Sodium cyanide tablets are dissolved in a bottle to form a toxic liquid that is squirted on the fishes in the vicinity of a coral reef. The mixture stuns the fish without killing it, making it easy to catch in a net, or even by hand.It started in 1960 in the Philippines to supply the international aquarium trade. But since the early 1980s, a much bigger business has emerged: supplying live reef fish like coral groupers for the restaurants of Hong Kong, Singapore, and, increasingly, mainland China. Cyanide kills organisms in the ecosystem, including the corals forming the reef. It has devastated many reefs of the Philippines and eastern Indonesia – where an estimated 65 tons of cyanide are poured into the sea each year. Counter measures. Luckily some counter measures were also taken to protect the area. In 2012, the director of the Philippine Bureau of Fisheries and Aquatic Resources declared an “all-out war” against dynamite fishing and other illegal fishing practices. In 2014 the Reef Defenders began an aggressive program to create a network of Background Blast Monitoring (BBM) equipment throughout South-East Asia. BBM equipment has also been installed at Mabul Island in Sabah, Malaysia. Another initiative was the decision made in 2014 by the government of the Raja Ampat islands in North Western New Guinea to ban the harvesting and trade of sharks and manta rays from its marine waters.